« The quickest kind of stashbusting! This is one of my much-loved vintage Singer sewing machines. She is called the Bluebird of Happiness, and she’s painted pale Sky Blue with dark blue accents. She is a 359K straight stitch machine, manufactured at the Kilbowie factory in Clydebank, Scotland. She has an EY serial number, which is not listed in the Singer archives, but from Internet research, I think she is probably a 1967-1969 model. There is nothing low-end about the way she performs — a nice even stitch every time, and she is extremely quiet for a 40-something-year-old mechanical sewing machine. I also wanted to piece quilt blocks with this machine but was having difficulty maintaining a consistent 1/4-inch seam. 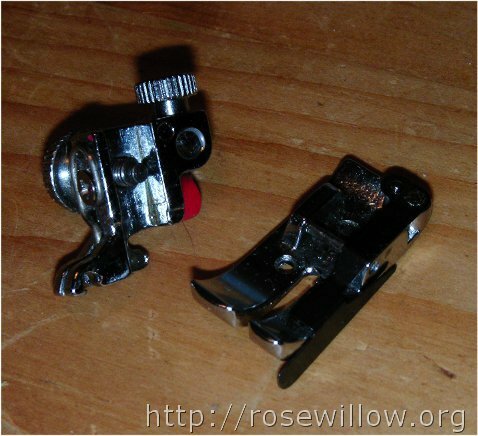 I looked all over for a Singer 1/4-inch foot to fit her and could only find one for Featherweights (Singer 221K) that would have to come from America, and it was very, very expensive. 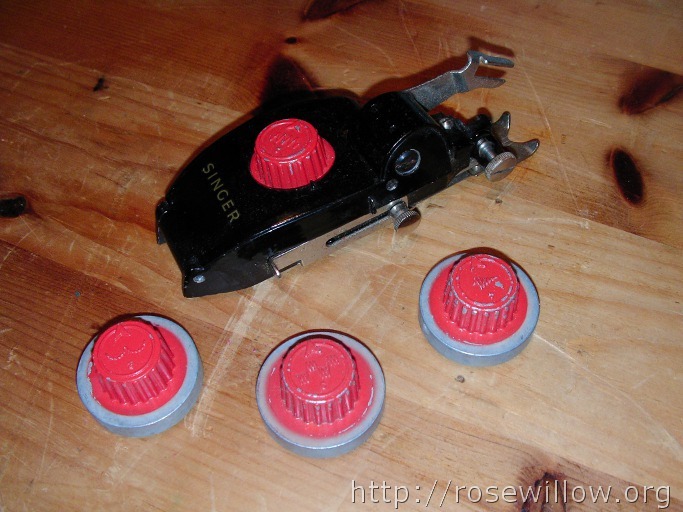 So….I made my own 1/4-inch foot adaptation for this machine using a low-shank connector and a snap-on foot that were salvaged from another brand of machine whose motor had burned out and couldn’t be repaired. See what the Bluebird can do now! We were happy before, and now we’re overjoyed! She is pretty – I hadn’t seen a blue one of those before! I think I have a green or tan one somewhere in one of those boxes in the basement. 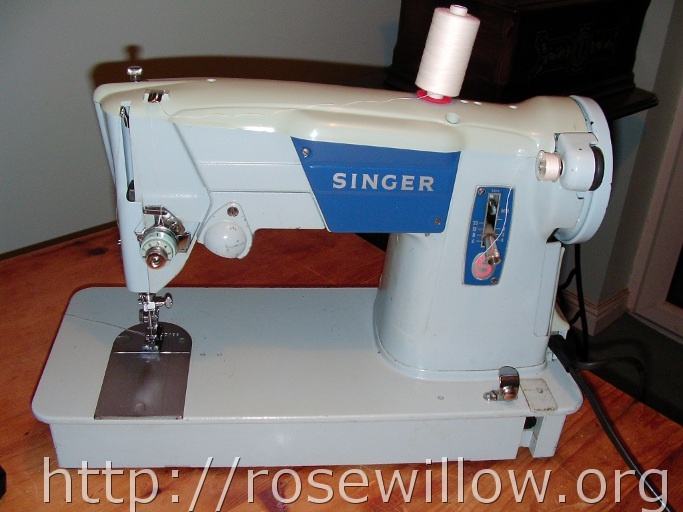 Several years ago I gave my sister a Brother 15 class machine that was a beautiful blue… probably from the 50’s. 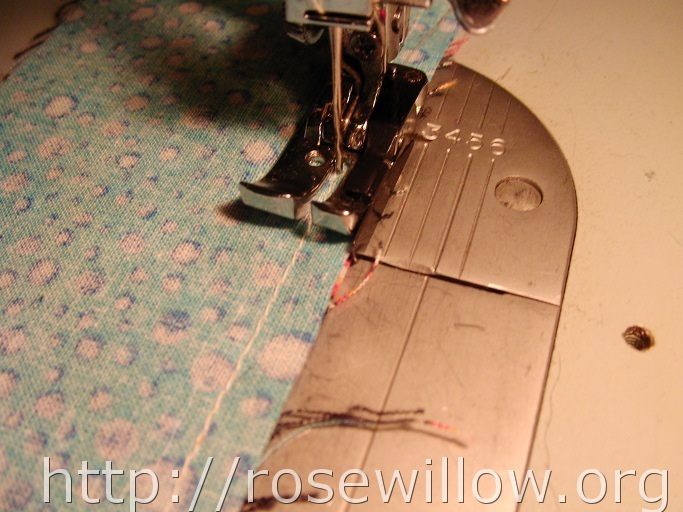 I often use an adjustable seam guide that screws into the bed to keep a seam. Oh and if you want to have some fun… get one of the ‘rufflers’ and play with that.